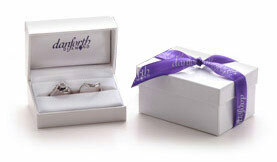 Every jewelry item purchased from Danforth Diamond will arrive in a beautiful gift box ready for giving. If you purchase an engagement ring set with one of our Danforth Diamonds, your ring will arrive in an exquisite wooden lacquered box with a supple leatherette interior. 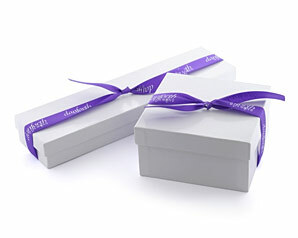 The wooden box will be gift packaged in a standard white box wrapped with a purple satin ribbon. We even include a suede pouch for easy transport if you need to carry the ring in your pocket for popping the question. If you purchase a ring setting without the center diamond or a wedding band, your purchase will arrive in a small black hinged jewelry box. This jewelry box will be packaged in a standard black box wrapped with a purple satin ribbon. If you buy a matched set OR his and her bands, those rings will come side-by-side in a wider width hinged white jewelry box. This jewelry box will be packaged in a standard white box wrapped with a purple satin ribbon. If you purchase a jewelry item such as a bracelet or necklace your purchase will arrive in a white box wrapped with a purple satin ribbon. Would you prefer a customized ring box? Visit www.elegantwoodworks.net for a great selection of customized ring boxes made from exotic woods. You choose your preferred wood, style and shape. Engraving plates available in brass, nickel or black.